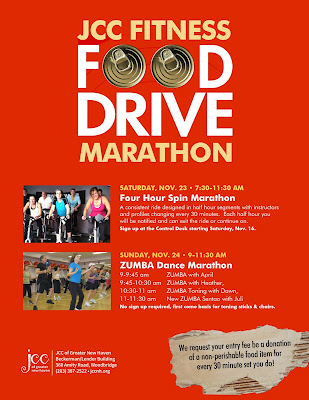 What's Up New Haven: JCC Fitness Food Drive Marathon - This Weekend! 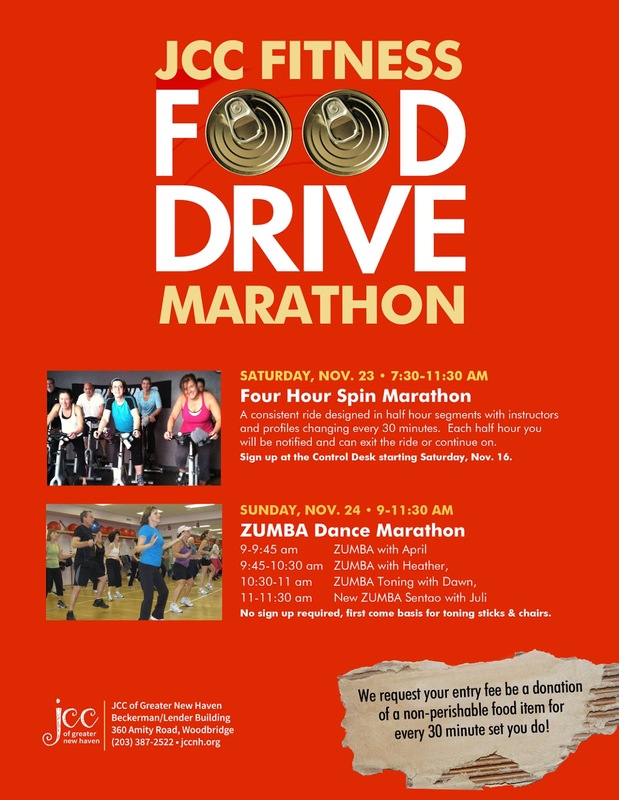 JCC Fitness Food Drive Marathon - This Weekend! Before you pile on the hot dogs at the Yale-Harvard tailgate on Saturday: think fitness! The Jewish Community Center of Greater New Haven will a host a Fitness Food Drive on Saturday, 11/23 and Sunday, 11/24. 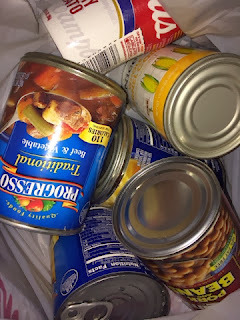 One can of non-perishable food gets you 30 minutes of fitness -- as well as a fulfilled heart and spirit. :) You can always donate more to party more! Non-members are welcome to join this event. Saturday will be a Four Hour Spin Marathon with new instructors every 30 minutes from 7:30-11:30am. Sign up is required for Spinning. Sunday is the Zumba Dance Marathon portion (yay!) with new instructors every 45 minutes. Sign up is not required for Zumba. 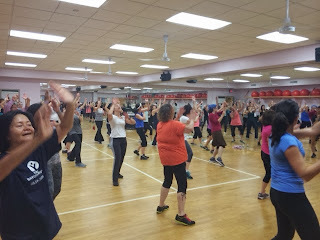 Please note for Zumba: A couple of blocks feature specialty Zumba classes. The 10:30-11 block is Zumba® Toning, in which Toning Sticks are used to provide lightweight resistance. The 11-11:30 block is Zumba Sentao™, in which a chair is used to provide targeted resistance training. Toning sticks and chairs will be provided by the JCC. I will be there on Sunday, and I hope to see you, too! Update 11/25/13: What a fun event! Several boxes of food were collected, and Zumba fans of all levels shook, shimmied and squatted their way through the morning. Congrats to instructors April, Heather, Joy and Julie on a great job. Thanks to Fitness Director, Susan Donovan, for alerting What's Up New Haven to this high energy event! What's Up New Haven, LLC. Simple theme. Theme images by fpm. Powered by Blogger.